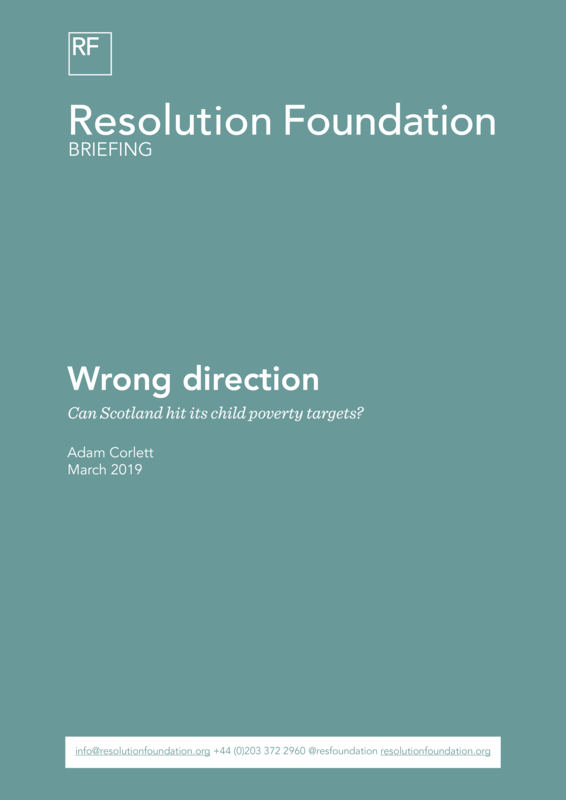 You are here: Home > Publications > Wrong direction: can Scotland hit its child poverty targets? In 2017, Members of the Scottish Parliament unanimously voted the Child Poverty (Scotland) Act 2017 into law, creating targets for the reduction of child poverty. This followed the UK government’s abandoning of its 2020 targets, and marked a welcome attempt to ensure that poverty reduction remained a policy priority north of the border. But agreeing to reduce poverty is easier than doing it. So what are the prospects for the Scottish government hitting its goals? 23 per cent of Scottish children (around 230,000) lived in households that were below the UK relative poverty line in 2016-17, compared to the UK-wide figure of 30 per cent. The Act requires the Scottish government to reduce this to below 18 per cent by 2023-24 and below 10 per cent by 2030-31. But our projection – combining economic forecasts with planned tax and benefit policies – suggests the Scottish child poverty rate is in fact likely to be higher in 2023-24 than in 2016-17. The projected rate of 29 per cent would be the highest in over twenty years. Although uncertain, such an outcome would leave over 100,000 more children living in poverty than if the interim target were (just) met. UK-wide benefit policy is the key cause of this, with the benefit freeze, two-child limit and other welfare cuts taking substantial amounts of money from lower income parents. But the Scottish government also has the power to reduce child poverty, and much will depend on the generosity, design and funding of the promised ‘Income Supplement’. The Scottish government should also be concerned, however, with the quality of existing poverty statistics. Due to an under-reporting of benefit income in household surveys, it may be that the existing targets will eventually need revising and that recorded poverty trends may not fully reflect policy changes.